The rules brought in by these laws aim to protect workers’ rights: compliance is mandatory. In accordance with Brazilian legislation the Ministry of Labour and Employment must inspect establishments to verify whether the legislation is being obeyed; if not, it may impose fines. 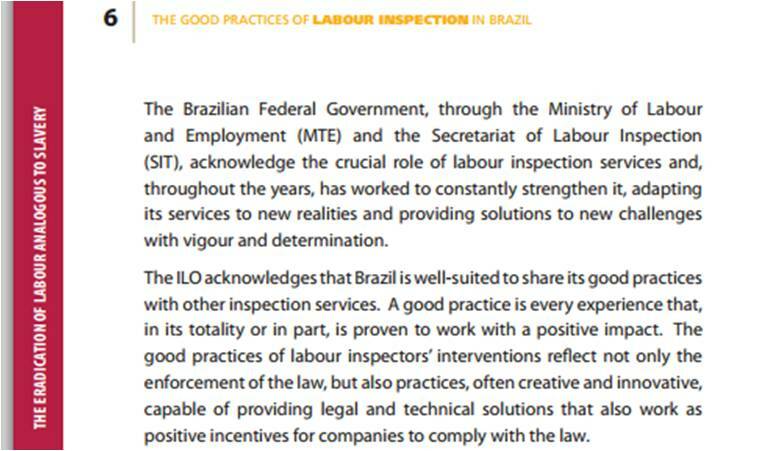 The ILO recognizes Brazil’s inspection of working conditions as a benchmark for best practices. In Brazil, whenever any given individual works for another individual or entity on a regular basis, being paid, and under supervision, this constitutes a labour relationship. All workers must be duly hired and registered. 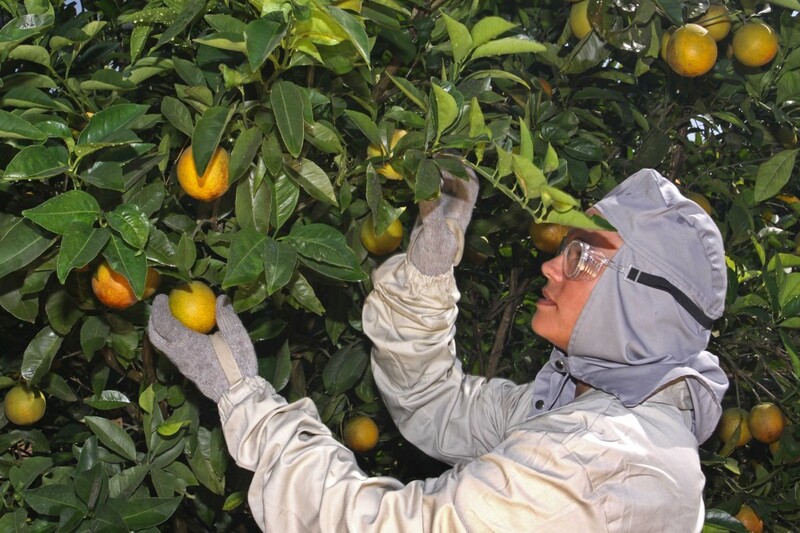 Under Brazilian legislation, inspection of work is the exclusive prerogative of the Ministry of Labour and Employment (article 21, Brazilian Constitution), through its workplace inspection secretariats and the regional labour inspection superintendents’ offices. The Ministry covers the entire territory of Brazil, and all kinds of establishments and properties are encompassed, be they public or private, professional or not-for-profit; this includes foreign ships in Brazilian waters. Provided they produce the right credentials, labour inspectors may freely enter any place that is subject to inspection at any time of day, and without warning. During such a visit they will typically check compliance with legislation and regulations governing working conditions and labour rights. Employers in breach of the laws or proving negligent in their application of the law are warned and are subject to sanctions, repeat inspections, fines, prosecution and in extreme cases their operations may be halted. Since the government has only a limited number of labour inspectors, criteria are used in order to define inspections. Abuses denounced by trade unions, civil society organizations, or workers, for example, are given priority. The MPT website provides another way of making anonymous accusations. When an establishment is inspected, the officials may ask to see documentation about previous periods, not only concerning the moment of the inspection; employers must therefore make sure all workers are currently registered, and wages and taxes properly paid up, in addition to carrying out procedures laid down in the law, such as medical examinations on hiring and dismissal, and possessing correct safety certificates. In addition to routine inspections, the Ministry also carries out campaigns on specific issues such as correct registration of workers, and the eradication of child labour. The ILO has acknowledged Brazil’s labour inspection work to be an example to be followed, in its document entitled “Good practices of labour inspection in Brazil”, the highlight of which is the country’s experience in eradicating child labour and forced labour. The Federal Government recently announced a package to boost the inspection of informal labour, increasing fines, training more than 1,500 new inspectors, and enhancing electronic monitoring. Brazil’s Federal Constitution authorizes the setting-up of trade unions and associations regardless of government approval. Representation is mandatory and does not depend on joining: nonetheless the right of workers to join unions in their professions if they so wish is guaranteed. Employers must identify the union their employees should join, since there is a union for each industry and location. Employees and employers must pay an annual contribution to cover unions’ expenses. The MPT collects these contributions in a single fund which is then distributed among the unions. – specific circumstances may trigger additional payments, such as night-time work or particularly dangerous work. Additionally, there may be special conditions under agreements with the trade unions in accordance with the location and the sector, and these are mandatory whatever the membership status of the employees. Regulatory Standard (Norma Regulamentadora) 31, introduced by the Ministry of Labour and Employment, sets forth prerequisites to be met when organizing rural labour and in the rural place of work. The goal is to ensure that rural work is carried out and planned in a way that is compatible with workers’ health and safety. 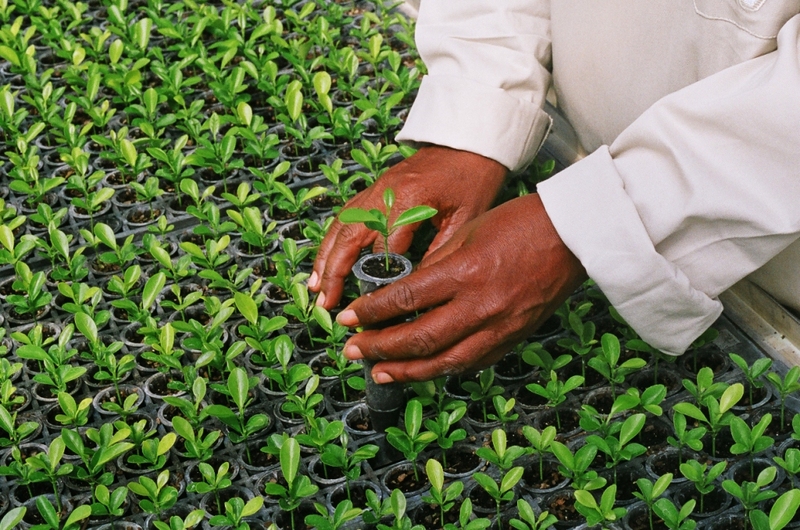 It is therefore applicable to agriculture, livestock, forestry and fisheries, as well as to industrial activities carried on in agricultural establishments. 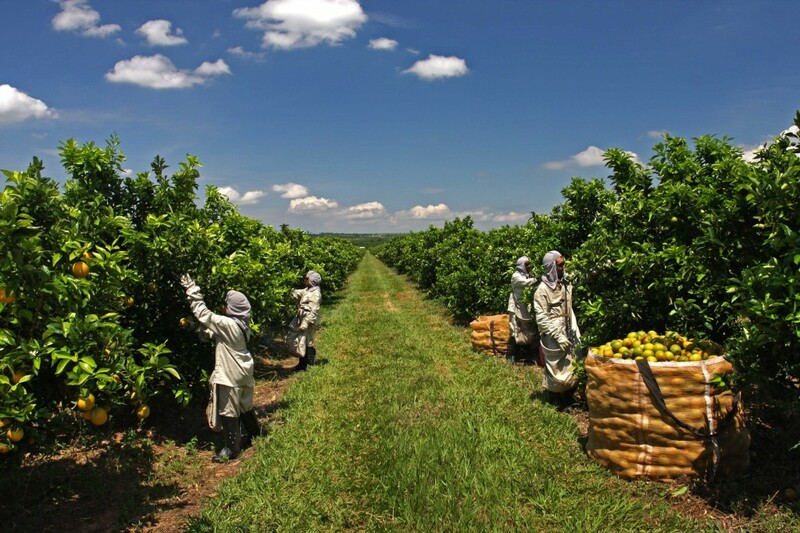 The standard addresses minimal working conditions for agricultural workers in order to protect their health, physical and psychological integrity, and prevent accidents. – to comply with the mandatory presence in every establishment employing twenty or more formally hired workers of an Internal Rural Work Accident Prevention Committee (Comissão Interna de Prevenção de Acidentes do Trabalho Rural—CIPATR).